I have never been to Hainan or tasted the real Hainanese chicken rice. My version of Hainanese chicken rice is kind of fusion with Malaysian style and a touch of Cantonese. 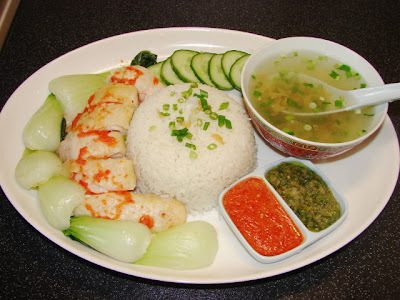 Can't really called it authentic Hainanese chicken rice maybe just Yummy Chicken Rice. The fragrant rice has really filled the whole house this evening, I can still smell it after few hours. There are several things need to be done right to get the right flavour the texture. The chicken must be velvety soft and succulent. The rice must be very fragrant. Condiments are essential, I always go for a chilli ginger sauce and a Cantonese spring onion and ginger paste. Clean the chicken. Find a stock pot that will fit the whole chicken in. Fill the pot with water to about 3/4 full, bring this to a rolling boil. Add in the ginger. Gently put the chicken it, ensure the whole chicken is immersed in the boiling water, if too much water take some out, if not enough add more. Gently simmer (without a lid on) for about 10 - 12 minutes, don't let it boil. Turn the heat off, put the lid on and leave the chicken to poach in the hot water. After about 40 minutes, the water would have cooled down a bit, turn the heat back on, very gently simmer for about 10 - 15 minutes (without the lid on) to bring the water temp. up again, then heat off. Lid on and continue poaching without heat for another 20 - 25 minutes. The chicken should be cooked through now. Some Chinese like the chicken very pink so they will poach the chicken a lot shorter about 40 - 45 minutes all together. Take the chicken out and run under cold water to cool it down right away. Drain and leave aside to prepare the other parts of the dish. Reserve the poaching liquid, if you have some chicken bones add them in now and boil the stock for 30 - 40 minutes. Use stock for rice and soup. Add stock and other ingredients, tuck the padanus leaves under the rice. You can cook the rice using a rice cooker. If you cook the rice using a saucepan, bring the rice to a boil, lower heat and let the rice absorbs all the liquid. Turn the heat to the lowest heat possible. Let it simmer for another 10 - 12 minutes. Heat off and let it stand for 15 minutes. The rice should be cooked then. Hand chopped the spring onion till very fine. Heat the stock made earlier. Season with salt/soy and pepper. If you like it tastier add a pinch of chicken stock powder. 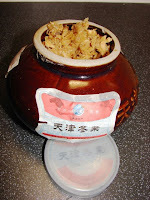 Chopped some Tienjin salted pickled vegetable. Add pickled vegetable and spring onion into the boiling soup. Heat off. Ready to serve. Lastly a bowl of hot soup. *** the red stuff you can see on the photo on the chicken is just some of the chilli sauce. If any chilli sauce or spring onion paste left, it'll keep in the fridge for a week. If not can freeze.